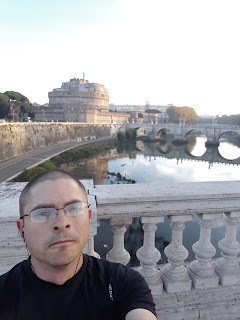 Me "crossing the Tiber" (see what I did there?) on my morning run in Rome this past November. For the past two years during Lent I have deactivated my social media accounts. As Ash Wednesday neared this year, I was pretty sure that I didn't need to do it again. I honestly thought that I had developed some better online habits. But then this morning, with time set aside to work on writing, I decided to give Twitter a quick glance. So I deactivated. Again. And for good measure, I decided to blow the dust off of this blog. All I can say is that writing in short bursts like I do here can be productive--it can loosen up my fingers and mind to better deal with my other writing projects. And I like blogging here--even though it wouldn't kill me to update the look and layout of this blog. I'm not sure that it could look more 2010. Maybe I'll get to that over Lent. Or maybe I'll just keep it this way until it becomes charmingly retro. A quick rundown of what has happened since blogging last. First, my family and I spent the fall semester in France. I could probably say more about that in future posts. But suffice it to say, it was a joyful, life-affirming experience that will continue to shape us for years to come. Second, I am running and currently listed as "healthy." Most of my runs in France were along a remote, rural road that traced along the Tarn River. I will never forget the scenes and scenery, the quiet beauty that marked every mile. Since returning, I have been eyeing up a half-marathon in the spring some time. Not sure which one, but I should probably sign up for one soon. Finally, writing... An edited volume that I have been working on has been sent to the press. Its proposed title is Gods, Games, and Globalization. I can't wait to finally see it in print. As for my own religious history of sports, well... I had some good momentum in France, but I kinda let it slip after Thanksgiving. To unlock my writer's paralysis, I submitted a proposal to a conference this April. So if Lent is a time to reflect and reassess, it is probably worth limiting the distractions and taking stock of what really matters. Will lessons be learned this time? Heck no. But that's why Lent happens every year.